December | 2009 | E-verything! 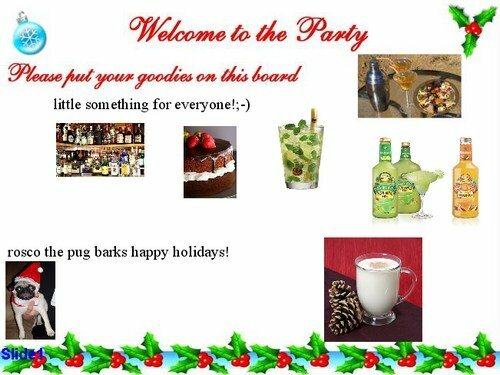 For our final Edublogs webinar of 2009 we had a great party on Elluminate that we recorded with lots of goodies to share and special good wishes from Rosco the pug. We had four games to share and play but only got around to two of them as these first were such fun and we had an early finish to give people time to get to the Edublogs Awards. Shelly (@ShellTerrell) brought along “Win, Lose and Draw” which caused much amusement as teams tried to draw on the whiteboard (always a challenge!) and guess the subjects of the drawings. The drawers made a great job of the difficult task posed by drawing Shelly’s wickedly difficult Christmas related subjects. Phil (@philhart) then offered “Deviousness” for our entertainment. 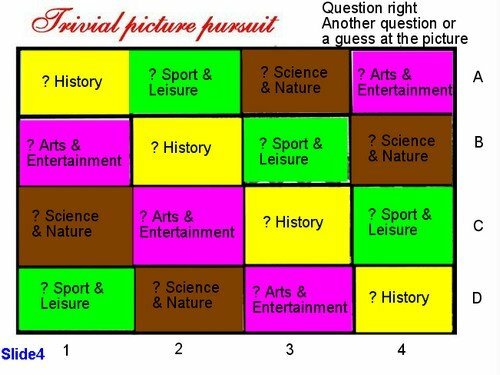 The objective was to give a clue about a category, word, phrase etc (in this case Phil chose “an embarrassing personal condition”) and then to avoid the group guessing this by giving evasive answers to their questions without actually lying. This caused great hilarity as we all made Phil the “guinea pig” and he was most evasive! 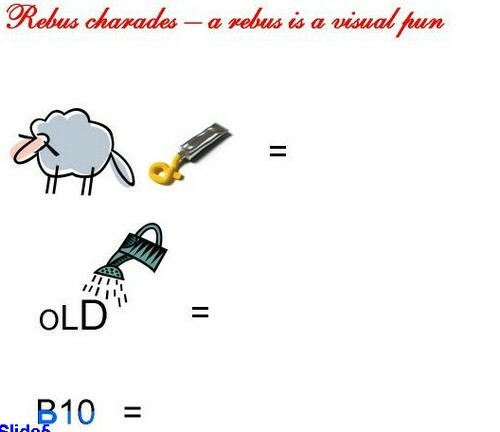 We ran out of time at this point with two games still to play “Team Challenge” and “Rebus Charades” – I will post about these games in the next couple of weeks as we didn’t play them on the recording. 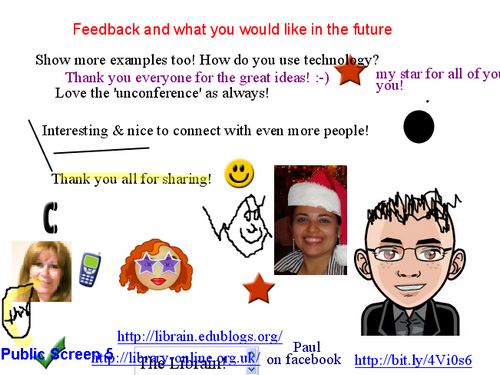 So it was time to wind up our sessions for the year with a quick feedback slide and a reminder to join us in 2010. First session of 2010 on Elluminate as usual. Depending on your timezone will be on Thursday January 7th at 23:00 GMT (6pm USA EST, Midnight CET) or Friday January 8th at 7am West Aus, 10am NSW. Wishing you all a Great Holiday and a Very Happy and Successful New Year! 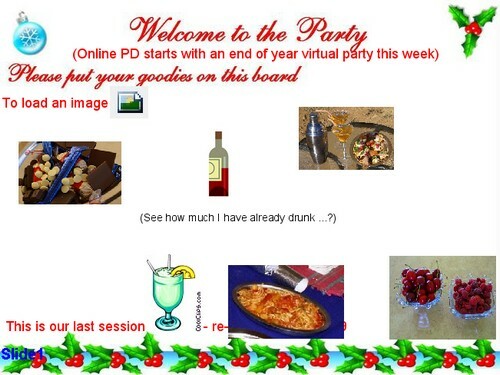 Last year we had an End of Year Party for our regular weekly webinars. This was great fun so it seemed like a good idea to do the same again this year. Our last session of the year (Thursday 17th or Friday 18th depending on your timezone) is earmarked for this. The party will immediately precede the time arranged for the Edublogs Awards (it will be in a different Elluminate room). We will finish a little early giving you plenty of time to move rooms for the Edublogs Awards which have to be the most exciting event of the year for Web2.0 oriented Educators. A good way to practise working on someone elses desktop – students love to take control of my desktop and show how they use applications. This can be made this really subject specific and have a subject relevant image to be revealed. These work well in an English language context whether as first or second language and again could be adapted to be subject specific. Other posibilities include drag and drop activities and wordsearch or similar. Most things that you might do in a face to face situation will work although they might need some modification. If you have an idea for a game but are not sure how you can make it work on Elluminate I may be able to help. Either leave a comment on this post and I will get back to you, or DM me through Twitter: JoHart and I will be happy to try and help with the Elluminate features. Our Edublogs Serendipity sessions are unconference sessions. This means we don’t have a pre-planned topic but ask you to come along with topics you want to discuss and/or learn about. We put these on the whiteboard and the topic is chosen by a poll. This week was a very lively session (recording here) with worldwide participation from a great bunch of people. We started with a small number but people came in throughout the session so that we had about 17 participants. The hands down winner was collaboration! Just to clarify for everyone – although we often use the term school throughout sessions we have regular participants from vocational, further and higher education and also librarians from these sectors as well as from schools. Using the term “school” is a convenience and refers to education in general. Several people were already involved in collaboration with other schools around the world. These shared some of the strategies they use generating considerable discussion and ideas in text chat as well as through audio and on the whiteboard. One of our participants (Shelly, well known to many of us through Twitter (@ShellTerrell) and her blog) then described a particular complex collaboration (involving large numbers at each end of the conversation) that she is planning and asked for ideas. These came thick and fast ranging from single applications to blends of several and leading us once again to consideration of limited bandwidth and its impacts and implications. The session was itself a wonderful illustration/example of a global collaboration with all of us focussing on the practical strategies of managing a specific event. By this point time was running out so feedback and future ideas were the order of the day – everyone then had a great time putting avatars, clipart and comments on the final whiteboard. We finished up with a reminder that next week’s session (Thursday 17th or Friday 18th December depending on your timezone) is an End of Year party. We invite you to bring delicious virtual food or drink to share, and challenge you to develop and bring an Elluminate party game for us all to play. For ideas look out for my post about this in the next couple of days! Did you know? Elluminate – Break out of the mould! This post was prompted by the fact that if I had tried to put all of the “how to” of Breakout Rooms into the “Breakout with Elluminate” post it would have been too long for anyone to read. 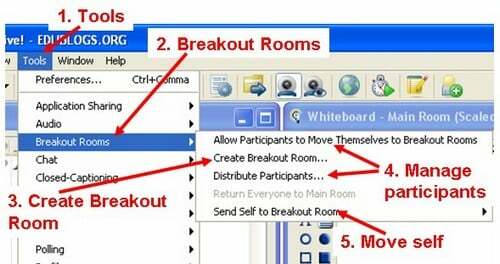 Breakout rooms are probably one of the Elluminate tools I have used least along with playing multimedia. This is mainly because in my work context in rural Western Australia we have students online from home with low bandwidth and often fairly old computers. In this setting both of these tools can be a bit problematic. However despite occasional issues I continue to use breakout rooms but I do think and plan carefully before I use them. I try to minimise the number I use at any one time and to have contingency plans in case participants have problems. Breakout rooms bring an extra dimension to your Elluminate sessions by enabling several different activities to occur at the same time by providing extra “mini-rooms” within your virtual room. 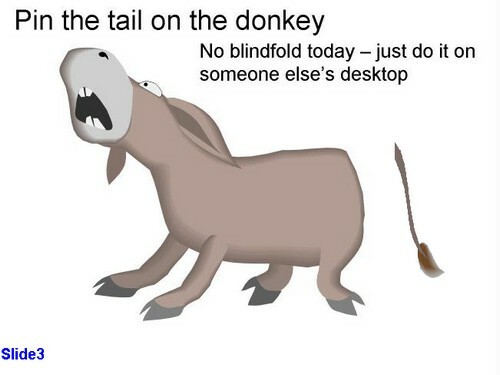 This lets you work in the virtual room in much the same way as you would in a real room, with one extra advantage – if you have people working in groups they can’t eavesdrop on each other either intentionally or inadvertently. Breakout rooms have: independent audio; whiteboard; text capacity within the breakout room; text capacity to all; hand-up capacity to ask for help; transferrability of whiteboard to/from main room, and the potential to Application Share just within the Breakout Room. In addition I have found a breakout room very useful if one member of a group is having issues with audio or other Elluminate problems I can move myself and that person to a breakout room and help them troubleshoot without disrupting the session. As the moderator you are in control (hopefully!). You create and name rooms and manage how they are accessed and used by participants. Click Create Breakout Room – at this point you will be asked for a name for the room. Short names are easiest but not essential. I usually try to use something that relates to the question or activity in the room. In the current version of Elluminate there is an option to give participants control over their own movement to Breakout Rooms. This has enabled much more rapid distribution of participants. In previous versions there was only “Distribute Participants” this was a bit slow as it was necessary to select each person individual and go through a couple of steps to move them to their room. 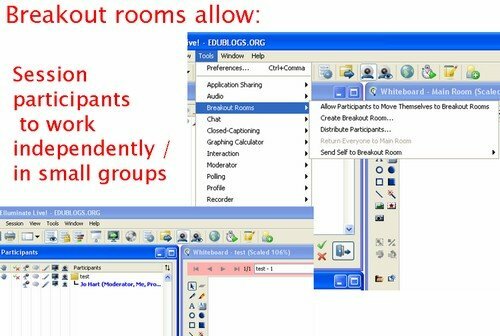 Also in this version it is much easier for the moderator to move between rooms using “Send self to Breakout Room” again in previous versions this was done using Distribute Participants and was consequently quite slow. One of the most useful aspects of the way Breakout Rooms work is the ease of transfer of pre-prepared whiteboards or outcomes of activities to and from the main room. 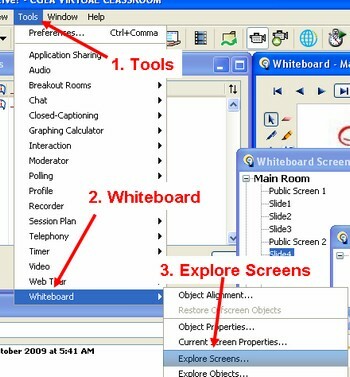 This is done using Explore Screens which is accessed through: Tools, Whiteboard, Explore Screens. Once you are in explore screens you can access all screens in the same way as you access file structures (using the “+” to move to the next heirarchical level). You see thumbnails of the screens which is very useful if you don’t have screen titles. Once you can see the screens it is easy to select the screen or screens that you want to move. 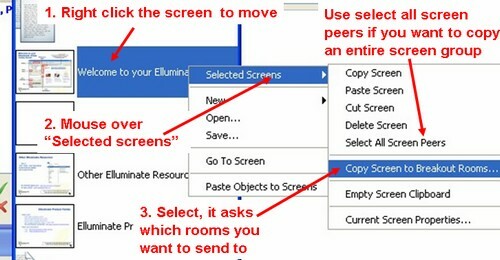 If you want to copy the entire group of screens you can select them using Select all screen peers. You can use simple copy and paste but there is an option to copy directly to Breakout Rooms which makes the process much quicker. To copy from Breakout Rooms to the Main Room you just use the Copy and Paste on the menu – remembering to move to the point you want to copy to before pasting. have a contingency plan in case you don’t have enough participants for your activities and/or some of the group have bandwidth issues. Our recent Edublogs webinar, (watch the recording for the whole session) 3rd or 4th of December depending on your timezone, was another in the occasional series about some of the features of Elluminate. As you probably all know by now I love Elluminate and am always happy to show how powerful it can be as a teaching and learning tool. A few weeks ago one of the possible topics that was suggested for our webinars was “more on Elluminate”, someone else had also mentioned that they would like to know about breakout rooms. This made for a simple choice of topic and one to make me think! Using breakout rooms when you have no idea how many participants, or what level of Elluminate experience they will have, can be quite challenging. For me it’s also important that these sessions are interactive for the participants – I very much dislike sessions which are “death by powerpoint” transformed into Elluminate. That approach seems to me to waste the potential of Elluminate and to perhaps be better served by just making a ‘cast of the slides with voice over and not using Elluminate at all. We were a little late getting underway – being a very small group – we hoped others might join. However the conference season is in full swing so we remained a small and select band. I started the recording – I almost forgot and was reminded (many thanks!) by someone in the group. We began with a quick poll on usage of breakout rooms. This was followed by a rundown of the features of breakout rooms and the moderator’s role in managing them. Then before everyone could fall asleep we moved on to trying out breakout rooms. I had pre-created two rooms each with a whiteboard question about possible uses for breakout rooms. See “Did you know? Elluminate – Breakout of the mould!” for more detail on the how, when and why of breakout rooms. The current version of Elluminate allows the moderator to give participants access to move themselves to rooms, so after inviting participants to put their virtual hands up I asked them to move to a room based on the order hands were up. They had ten minutes to brainstorm ideas in response the their question. A busy ten minutes for me – “flitting” between the rooms to check that they were all OK with the features. At the end of the brainstorming time I “beamed” everyone back to the main room. Oh dear! All that lovely brainstorming was on the whiteboards in the breakout rooms. Never fear Elluminate had the answer. We copied and pasted the complete whiteboards into the main room while application sharing so everyone could see how it was done. There were a variety of great ideas about the uses and contexts in which breakout rooms might be used. The next step was the anarchy phase – give everyone moderator rights so they could create their own breakout room and try a task and a copy of their whiteboard to the main room. As always this produced a few glitches but it’s always fun when everyone goes “feral” and “plays” without always realising how much power they have as a moderator. We ran short of time so didn’t get this activity finished – something that often happens when everyone is moderator. For more detail on the “how to” of Breakout Rooms see the related post “Did you know? Elluminate – Break out of the mould! Feedback was very postitive – people always seem to greatly enjoy the interactivity and the opportunity to try things out. So there will definitely be more on Elluminate interactivity options in the future. Join us in the Elluminate room next week 10th/11th for a Serendipity unconference session and for our last session before the Xmas break on the 17th/18th December depending on your timezone. See the Edublogs calendar for information about the last session – our Elluminate end of year party, where we invite you to get interactive with party games! We’ll be back “virtually” after the break on 7th/8th of January 2010.